This report focuses on the specialty chemicals consumed in the processing of pulp and manufacture of paper. It excludes commodity chemicals such as chlorine and oxygen, hydrogen peroxide, sodium salts, and sulfuric acid (used mainly in pulp production), as well as fillers and pigments (mostly china clay and calcium carbonate). It also excludes water treatment chemicals used in the paper industry. Specialty paper chemicals fall into three categories: functional chemicals, processing aids, and pulp and fiber treatment chemicals. Growth in the overall demand for paper chemicals has been eroding since 2008. The shift from print to digital means of communication has led to the closure of small, inefficient mills and the consolidation of the customer base. Demand for packaging and sanitary and household grades of paper should help stabilize the market, but overall, future growth will be very slow. 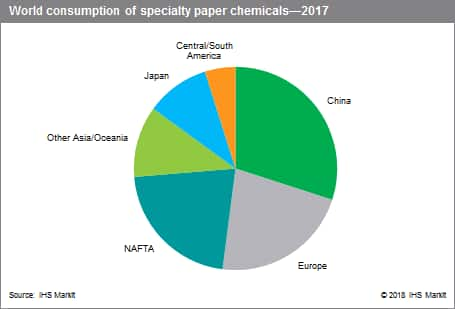 In constant US dollar terms, specialty paper chemicals consumption on a global basis is forecast to grow at less than 1% annually over the next five years. Consumption is expected to decrease or remain static in the established regions of NAFTA, Europe, and Japan. The prospect remains somewhat positive for Central and South America, China, and the rest of Asia, but growth has slowed in these regions as well. China’s consumption, which had averaged 6–6.5% per year in recent years, has slowed dramatically because of overcapacity in the paper industry and the government’s push for stricter environmental compliance. Specialty paper chemicals help reduce the consumption of water and energy, increase the use of wastepaper, and save raw materials by decreasing the paper weight without sacrificing the functional or optical properties of the paper sheet. They have also enabled the tremendous increase in the speed of paper machines. Often, they are formulations of several chemicals, but there are also many single-chemical products. Functional chemicals, which include coating binders, dry- and wet-strength additives, sizes, and specialty coatings, as well as dyes, pigments, and whitening agents, were the largest product class in 2017, followed by processing aids and chemicals for pulp and fiber treatment. The largest consumer of functional chemicals worldwide was China. It had the highest consumption of pigment binders, dry-strength additives, sizes, and dyes, pigments, and fluorescent whitening agents in the world. NAFTA and Europe were the largest consumers of processing aids for paper and board manufacture in 2017. This product class includes retention and drainage aids, pitch-control agents, defoamers, and biocides/slimicides. China is the largest consumer of pulp and fiber treatment chemicals, which include bleaching and pulping specialties and deinking agents. Because it is deficient in pulp resources, China imports significant volumes of wastepaper and paperboard for conversion to pulp. Thus, it has the highest consumption of deinking agents and bleaching specialties in the world. NAFTA and Europe are also major consumers of these chemicals.